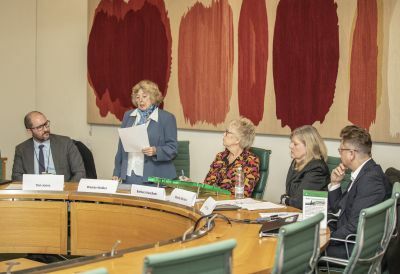 The discussion was based around rationing within the NHS and is in support of the launch of the MTG’s new campaign, Ration Watch, during this year’s Medical Technology Awareness Week. The NHS has been practicing the rationing of treatments that were once readily available to patients more and more due to cost cutting. Much of the work of the MTG has been based on gathering evidence and data which demonstrates just how common the practice of rationing within the UK’s health services has become. The Ration Watch programme will feature an online database of public information about where patients are experiencing limitations to treatments and technologies in the NHS. Through this online resource MTG hopes to raise awareness of the practice of rationing as well as spark more discussions and momentum to help reduce the instances of rationing and give better access to patients. The discussion on 4 of November served to provide perspective from patients, clinicians and experts into the need for access to treatment and health technology. Brenda, 84 was an excellent patient representative as she received a Transcatheter Aortic Valve Implantation (TAVI) an innovative minimally invasive technique for aortic valve replacement. Her treatment saved her life as she was told that without treatment she wouldn’t survive another 21/2 years and a more invasive surgery was not the ideal treatment for her advanced age. Since her treatment Brenda has lived a very busy and active life, including completing her doctorate, teaching, gardening and acting as a patient ambassador. Brenda addressed the group explaining how her treatment was the exact treatment needed for her to help give her life back. She said that the key to solving the inequalities in access to innovative treatments within the UK healthcare system was to have solid partnerships between patients, clinicians and commissioners with clear lines of communication.